Plot: Sec. I. Grave 505. 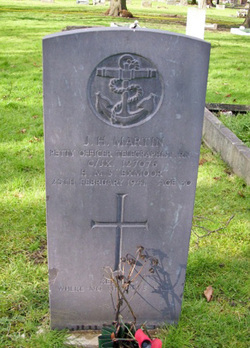 Petty Officer Telegraphist James Harold Martin was aboard the HMS Exmoor when it sunk in the North Sea February 25 1941. The HMS was escorting convoy FN417 from the Thames estuary to Methil, Scotland when it hit a mine or was torpedoed by German motor torpedo boat S-30. A fuel line ruptured, igniting HMS Exmoor which sank 12 miles off Lowestoft on the East coast of England. One hundred and five men including James Harold Martin perished. Additional information:Son of James and Elisabeth Martin; husband of Kathleen Olive Martin, of Gillingham. Grave/Memorial Reference:Sec. I. Grave 505.